rustle as you approach, ruined old heads turn, then all of you together settle into place. They with their Luckies, you with your Pall Malls. These barflies. You believe in them. have no reason to steal from you. They have ruined themselves to the point of sainthood. When the dark door creaks open, a soul leaves. But we stay. We're on a ship that went down years ago. never heard of it, and no story about it is credible. Its absence doesn't feel like absence. There are the taps, there is the tv. Sometimes a clock to look at now and then. There is the bar, the chairs, the carpet. "The Dive" is from Reed's first collection of poetry, Furniture, published in May 2015. His first novel is due out in 2017. 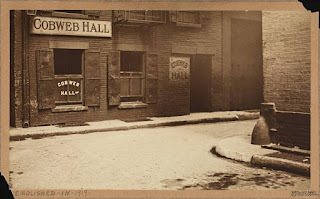 Photo: Cobweb Hall Bar, Duane Street, Tribeca, c1905. Photo by George B. Ritter. From The Old New York page on Facebook: "Demolished 1919 photo says. Looks like a dive bar for the ages." I can smell it, Jeremy, but what about that nasty jar of pickled hard-boiled eggs on the bar? I think this bar, a Portland staple for years, was even too cheap and low down to have anything edible in it.